Niela Collins displays her keys while standing next to her six-year-old son, Nylan Blackman, and congressman Dwight Evans, after opening the door to her new home in North Philadelphia on Jan. 12. This is the final building of a 21-unit Habitat for Humanity development in North Philadelphia. “Say that again!” urged U.S. Rep. Dwight Evans (D., Pa.), who was standing a few feet away for the occasion: the completion of Habitat for Humanity Philadelphia’s $3.7 million, 21-home Diamond Park development project in North Philadelphia. 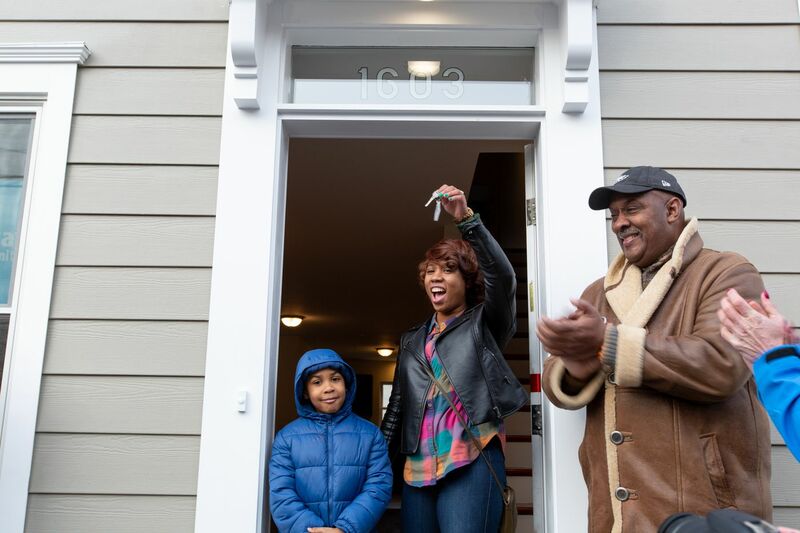 “I’m a homeowner!” exclaimed Collins, 26, to the applause of a few dozen volunteers, planners, friends, and family outside her house, a few blocks north of Cecil B. Moore Avenue. Each home in the three-block development is 1,150 square feet, featuring three bedrooms, 1.5 bathrooms, and a back yard. Habitat for Humanity built the homes for families earning between 30 percent and 60 percent of the local median income. In lieu of a down payment, homeowners in Habitat programs become vested in their property through 350 hours of sweat equity, according to the group. Customers Bank secured an affordable housing grant from the Federal Home Loan Bank of Pittsburgh to fund the final phase of the project. Habitat for Humanity has built and sold 217 energy-efficient homes to first-time homeowners in the city since 1985, according to the organization. “May this home motivate each of us to listen, serve, advocate, build, repair, and give more — so that every Philadelphian has a decent place to live,” Tya Winn, Habitat Philadelphia’s director of project planning, said during the dedication. Collins, a single mother and patient coordinator at the University of Pennsylvania, said she was inspired to apply for Habitat’s program two years ago after learning a coworker had become a homeowner that way. Collins said she had been living with her son, Nylan, in a one-bedroom apartment. She moved in with her mother while she awaited her new home. Nylan, now 6, said he had already picked out a room. “I can’t wait to play games in the basement,” he said.